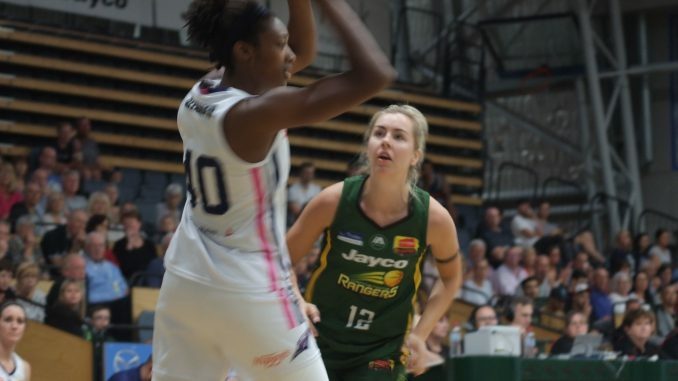 The Adelaide Lightning capped off a testing week with a hard fought win over a depleted Dandenong Rangers on Friday evening. After two consecutive losses, and being informed they need a new financial backer, the Lightning out-hustled the Rangers to win 86-80. Shooting 51% from the floor and pulling down 41 rebounds, the Lightning did everything in their power to hang on for the win. With a blistering start courtesy of Carley Mijovic, who managed 13 points in the first quarter, the Rangers had the Lightning looking sluggish and on the back foot. Mijovic, in by far her best game this season, was in hot form from inside and outside the perimeter going 5 from 6 on the floor. Adelaide was hamstrung early when star import Nia Coffey was dealt two fouls in quick succession. Coach Chris Lucas took no chances and pulled Coffey out of the game. The Rangers were then able to capitalise with a height advantage before Rachel Jarry was dealt the same fate and was seated on the Rangers bench. The Rangers bench would be outscored by the Lightnings back up players, 28-8 by game’s end, which delighted captain Nicole Seekamp. In the second quarter the Lightning offense of Seekamp (9 points), Kayla Alexander (12 points), Aimie Clydesdale (13 points) and Coffey (18 points) were able to spread the floor and stretch the Rangers defense. By halftime they had managed to reel in the Rangers and the teams headed into the break with Adelaide leading 55-54. After the big break, both teams were able to lock down defensively as Alexander and Penina Davidson started to take control on the boards. Steph Blicavs, who returned to the Lightning lineup, proved a calming influence on the floor alongside captain Nicole Seekamp. The Lightning stopped rushing on the offensive end, adjusted their early defensive failings and shut down Mijovic. The fourth quarter went much the same as the third, basket for basket with neither team giving an inch. A controversial offensive foul called on Aimie Clydesdale, when she collided with Rachel Jarry, winded her for a number of minutes and caused her to miss the last 26 seconds. With the ball back in their hands, a Rangers jump shot from first quarter hero Mijovic missed and Planeta pulled down a strong rebound and was fouled. Her resulting two free throws put the game out of the Rangers’ reach and the Lightning were home. After missing the last two games due to medical reasons, it was only fitting that the ball was in Steph Blicavs hands when the final buzzer sounded and gave the Lightning something to celebrate.